One of the first pieces of art I have a memory of, I remember seeing this on the news when I was about 4. Maybe it was the interpretation of my young mind (and nowadays I have much more understanding of what a 4-year-old understands ‘art’ to be) but I seem to remember thinking even then “that’s not art!”. I must have absorbed this view from adults too and even now, reading a few newspaper articles in preparation for writing this, the tone in which people talk about it is scathing. I am, of course, talking about Damien Hirst’s infamous The Physical Impossibility of Death in the Mind of Someone Living. A preserved shark. Not even, nowadays, the same preserved shark as it was in 1991 – that one was decaying, so the shark was changed in 2006. It seems to me that whatever the impact of TPIODITMOSM (‘the shark’) on art since 1991, it’s had an enormous effect on the wider public’s views on art. How many conversations about art has anybody had where eventually somebody asks how pickling a shark an be counted as artistic in the same way as the Mona Lisa. …then, for me, is that title. Just as you begin to think about it too deeply, you look again. This ultimate symbol of fear and death is harmless here. Nothing to worry about, for now. Go back to normal.The Physical Impossibility of Death in the Mind of Someone Living. I’m not saying the title is the artwork, I’m saying that it is an intristic part of the artwork. Change either the title or the physical object, and the nature of the piece changes completely – a piece of art, like much contemporary art is, as much about the idea as the form. I don’t me this piece is one of the most successful examples of an artwork as not only something to look at, but something to contemplate the idea of. I’m no big fan of Damien Hirst’s overall oeuvre and do feel that by the time he made his crystal-covered skull For the Love of God, he was playing to a reputation rather than still searching for meaning, but that doesn’t take away from TPIODITMOSL as a success. 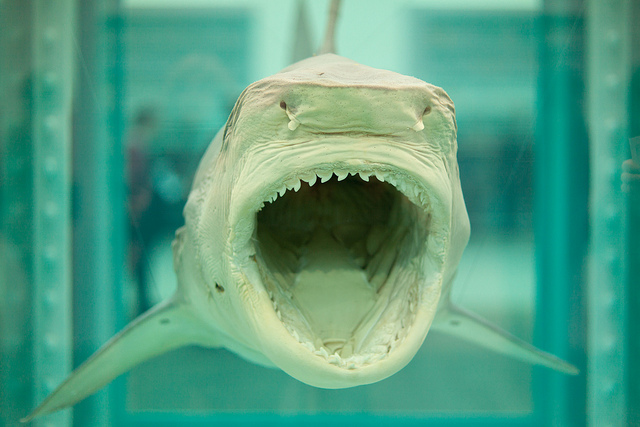 This entry was posted in Home, Let's Talk About It and tagged art, conceptual, Hirst, shark. Bookmark the permalink.